Single weight Vienna regulator wall clock made in Germany in the 19th century. Walnut case with full length glazed door to the front and glazed side panels. Wood rod pendulum with brass bob. Porcelain 2 piece dial with Arabic numerals. Fully restored with one years guarantee. Ref: a8120. Gustav Becker Vienna wall clock – SOLD. German Gustav Becker twin weight Vienna wall clock in walnut case. 8 day movement striking on a gong. Porcelain dial. Fully restored with one years guarantee. Ref: k0520. 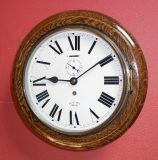 Mahogany cased English round dial wall clock. 12″ painted dial, signed “T. Braybrooke-Dorchester” with Roman numerals and spade hands. Fully restored with one years guarantee. Ref: b0310. 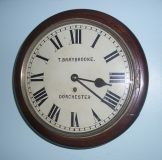 Rare 8″ round dial wall clock made by Smiths. Eight inch dial with Roman numerals, supplementary seconds dial and spade hands. Oak surround with brass bezel and flat glass. Fully restored with one years guarantee. Ref: d3010.